MOXY is an incredible tool for strength workout feed backs live but as well as to find " weaknesses, when looking at symmetries in the body's ability ( leg comparison or arm comparison. The values if comparing left and right are not absolute. So use trend information rather than absolute values for SmO2 and for tHb it is anyway not an absolute values but again a trend information. tHb. 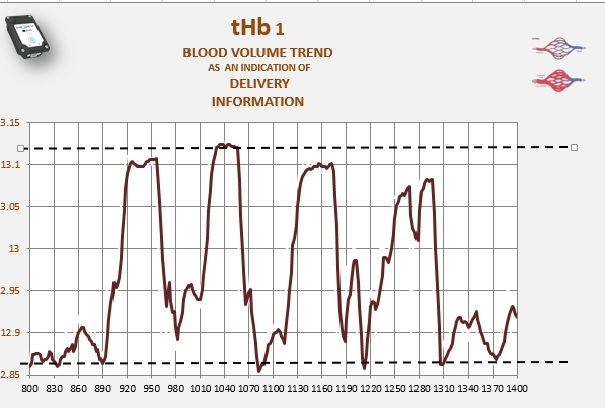 Trend of blood flow ( volume ) change. tHb can be used to see the " quality" of the contraction. Is it a contraction with an effort who creates a compression only. An effort who creates a venous occlusion or a full effort who creates an arterial occlusion. So 3 trends to look for. SmO2 is a trend information on the metabolic demand you create during the contraction. Do you contract so you deliver more O2 than you actually need. do you contract that you just use what you deliver or do you contract that you use more than you can deliver. If you do just a contraction with some compression trend than tHb will drop at the start and than leveling out on a flat section. If you let go tHb will go back to base line or over shoot baseline. 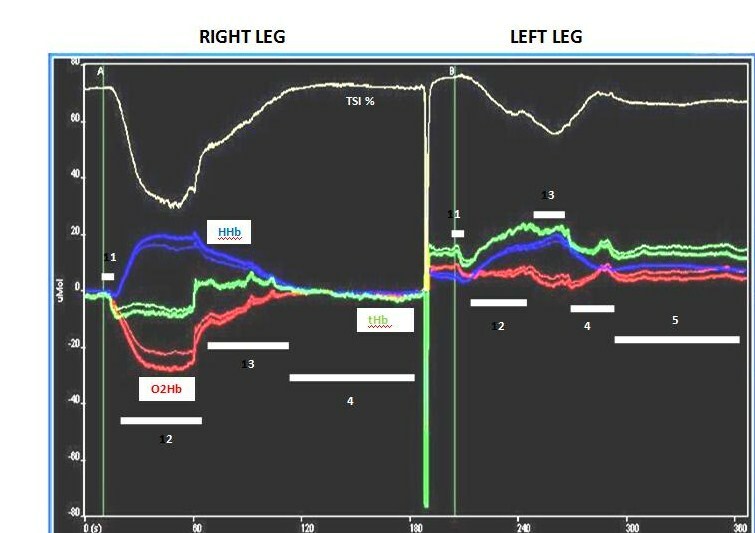 If you contract more than just compression and reach a venous occlusion pressure tHb will =initially drop (Compression outflow ) followed by an increase above and beyond base line due to "pooling" caused by venous occlusion an tHb will go up. At the end of contraction tHb will initially drop as a pooling out flow before settle back to base line. If you go all out and reach a arterial occlusion than you see an initial compression outflow with a venous occlusion tHb increase and a plateau due to art occlusion ( no in an outflow) at the end of contraction here you see a tHb outflow due to pooling outflow. 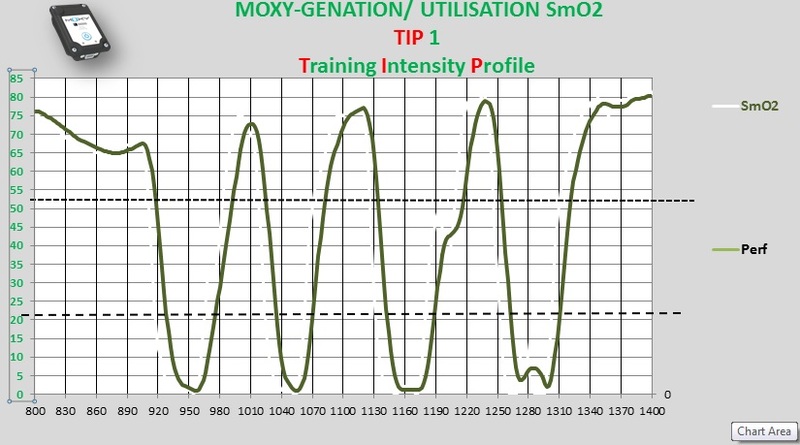 MOXY can be used to see the "effort" of a contraction by an athlete and or patient. Than based on this feedback we can decide , whether we like to have a local deoxygenation ( create an arterial occlusion ) or whether we like to have a systemic feedback loop to integrate systemic compensatory ptions into the equation. Here a case study with a systemic planned reaction. Next up on how to add or use SmO2 for strength and than how you can combinee both informations. Now lets' compare the " quality " of a contraction and the metabolic demand of the same contractions. Here the above tHb trend traces of the biceps contraction just as a trace. You can go back and see, what the different trend reactions mean. Summary : tHb can give you a better idea on the "quality" of the contraction. Meaning : Do you create a contraction force, which actually creates an arterial occlusion. Or do you create a venous occlusion, meaning that you still have O2 delivery but you have no CO2 output , as well a fast "pooling" this creates a situation, which has the name muscle pump or in some sports like rock climbing , forearm pump. Or do you control your contraction so you only create a compression to a certain degree so you keep inflow and outflow going on a certain level. Now let's see how the same workout looks, when we only show SmO2 traces. You can see a very low drop in SmO2. This often indicates an incredible great contraction quality, as an arterial occlusion is similar to an actual occlusion test, where we use a tourniquet to complete stop blood flow to a certain area. This as well is a kind of a " validation" whether your NIRS equipment actually works. Now look at the 4th contraction and you start to see the fascinating feedback we can get when looking during a workout on tHb and Smo2 in different ways. Let's try to put it in simple wording, like a live presentation from an ice hockey game. You see a " fascinating " mental preparation for the 4 th contraction in the tHb. tHb is increasing out of what ever feedback already before he actually start to make a contraction asking for O2 utilization. Than he reaches a certain level but lower quality of contraction force compared to the three x before. He reaches a 0 SmO2 level but not a full long lasting arterial occlusion.
. 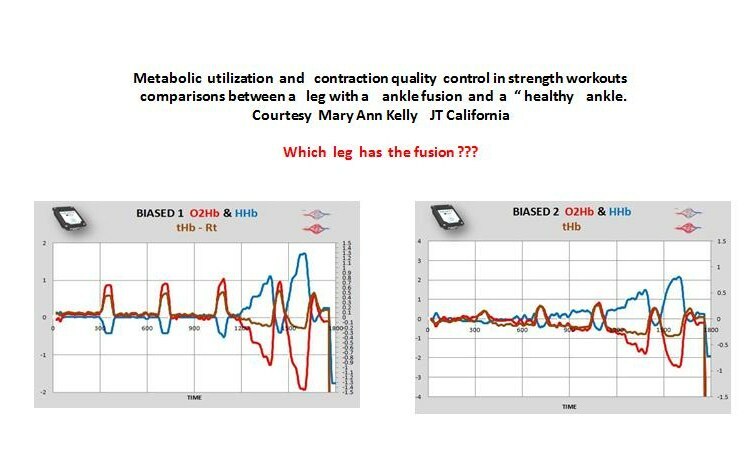 He has a problem to hold the contraction quality , in fact gives up the contraction quality and so strong, that he has a short pooling outflow, meaning his contraction force goes lower than the needed contraction force needed for maintaining at least a venous occlusion trend. If he would have backed of to a venous occlusion his tHb would not have dropped but increases ( inflow but still no outflow) in this case he " relaxed below venous occlusion strength so pooling outflow. 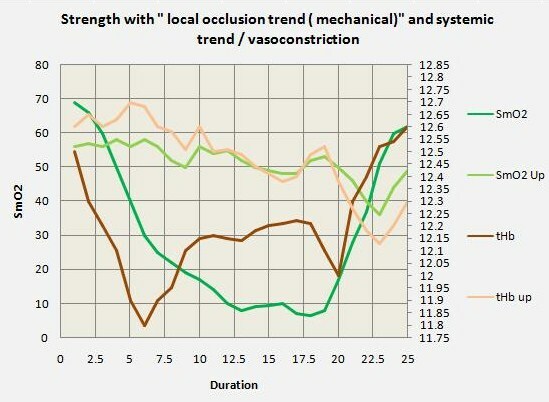 He saw the result on the screen and tried another effort and he reached venous occlusion strength so tHb increases and he is getting a small art occlusion plateau and SmO2 back down to ) after the short " relaxation. The fascinating part is the bodies ability to re oxygenate in a very fast way as well as deoxygenate in a very fast way. This clearly pushes the question out on the " classical 'idea of anaerobic metabolic path ways ( ATP CRP Glucose and finally O2 ) . perhaps Suhlman et all are right with a O2 involvement in msec upon contraction. The immediately drop in O2 suggests a very high O2 involvement in the so called anaerobe alacticid workouts. We asked that question long before. Perhaps the reason why we used this term anaerobic alacticid is due to the indirect equipment we used for testing. alacticid because we can't test lactate in that short time ( Lag time) of lactate from the working area to the finger. The lactate we produce is either immediately used as energy and as buffer help ( H + ) and than when in the circulatory system is moved into other muscles for energy supply MCT and never reaches in a high enough concentration the finger or any other test area. So as we never saw O2 change and no lactate, we named it anaerobe alacticid , when in fact it may be incredible aerob and incredible lacticid. ????? This opens some interesting questions. 1. Reasoning of cooling down "
The reasoning to get rid of lacatic acid ? still true or may be strange that we try to get rid of a great energy source after we just pushed the storage to the limit in the race or workout ??? 2. Lactate tolerance training: Why would we need to learn to tolerate a great energy source ??? 3. HITT for anaerobic alacticid metabolic pathway improvements ? Why is some research (Gibala ) suggesting that short 15 sec all out ( anaerobic alacticid 9 HIIT ) improves aerobic endurance as well. Perhaps because it si not anaerobic alacticid at all ???? look at the simple test. we may need to push a certain time to get stimulation for the " oxygen independent path ways as we first have to " get rid " of the O2 as it is stroed in our muscels. Why woudl nature create Mb when we never =use it or obnly at teh end of a workout. How about at teh start of a workout , where delivery ( CO / VE ) due to lag time not yet is able to try to delivery the potential needed O2 . 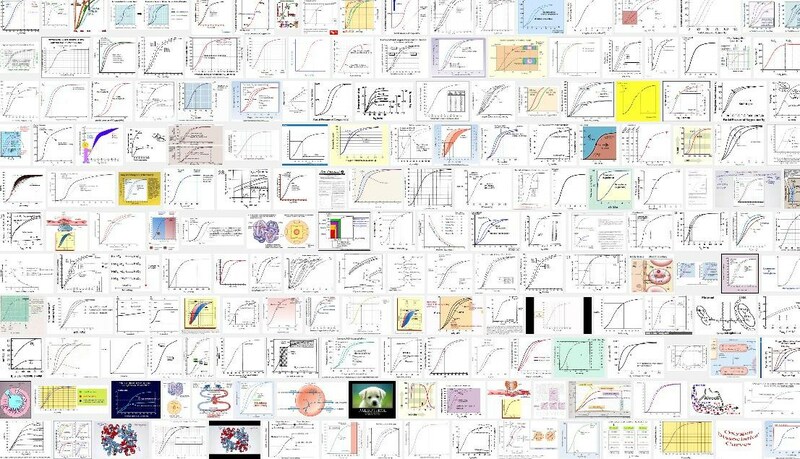 look at the O2 Diss curve in a complete way not in the way we learn. here a classical approach how we get introduced to O2 Diss curve and here what we should know on the full curve. Above a fun " Game " where is Waldo ? Can you find a complete O2 Diss curve including the Mb O2 diss curve. ?? And here a complete one to loo where the O2 can easier be taken at the start of a load . Now let's take a real case example. Client with a post op ACL recovery situation. Assessment,w whether the rehab program achieved a symmetrical working leg . Test are here is quadriceps vastus medialis. What we look is 2 main situations. a) quality of contraction. Can we reach an intensity where we see after a compression a venous occclusion trend and if we have a really good quality a arterial occlusion. 2. 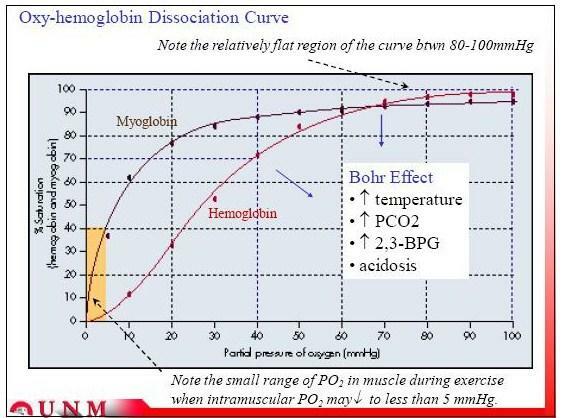 Metabolic ability : how good can we utilize O2 and can we hold the occlusion long enough to deoxygenate how far down ? Than we compare the 2 sides. Here a case study done many years back with a Portamon. You describe what you see and what is different and try to think why. Which one is the ACL leg. And here another example looking more in the utilization trend of a person with a foot fusion and a femur fracture from a few years ago and now tested a few days ago. This was done with a MOXY in California by Mary Ann Kelly JT. Which one is the leg with the fusion and the fratcured femur ?. Now an interesting section in using MOXY is the comparison between actual strength workouts and high intensity acyclic workouts we have in sports like ice hockey or soccer or many of the popular ball and game sports. The big discussion and ongoing discussion is the question of the " endurance"
The fact that Harre asked this questions in the late 1960 shows the ongoing discussion and with the merging ability to actually trace O2 utilization we now may have some new directions. The ability to sustain fatigue or the ability to recover fast ? When we look how moxy could help here ? 1. Endurance. : Finding intensity , where we just see, that Oxygen delivery and utilization is balanced and on a level where we create the highest performance. Billat would name it most likely VVO2. looking at the ability to utilize O2 as low down as possible and than at rest being able to reload O2 as fast as possible again. And repeat this over an over again without or minimal loss of performance. 2. For interval or strength we can use SmO2 as a guide with utilization targets ( numbers ) and recovery targets ( numbers ) as absolute values to determine duration of load, / duration of recovery and amount of sets. This holds true for strength and endurance. 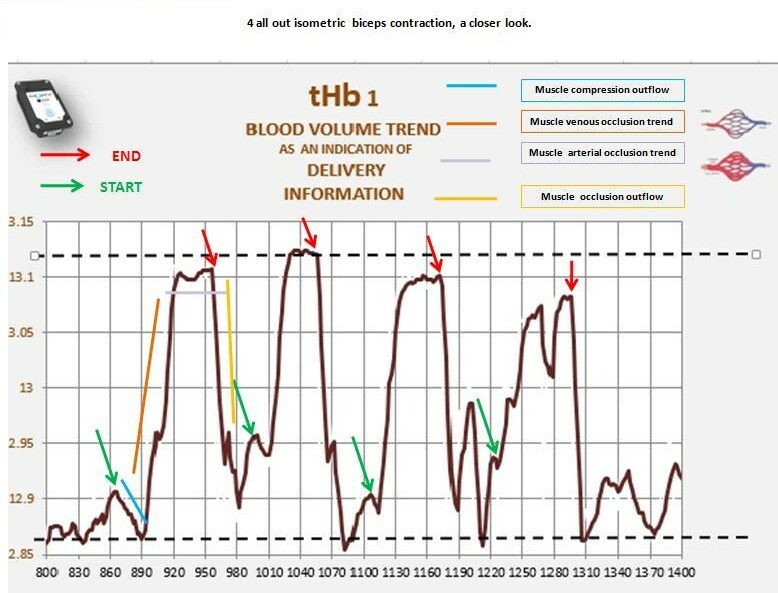 Than in this cases we can use tHb to guide quality and motivation of contraction intensity. The question is, whether the same workout shows the same reaction in different athletes or whether we see in MOXY assessment how different athletes may react on the same load and as such we can design much more and better individual training ideas. Here an example courtesy Brian Kozak. 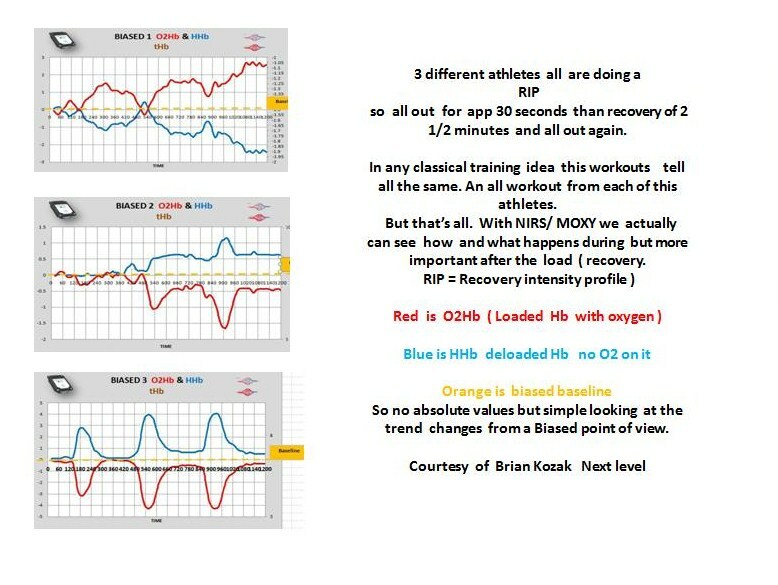 3 RIP loads form three different athletes and three very different responses. Over time you can see in your brain the SmO2 trend if you look at this pictures without having to look at SmO2 . 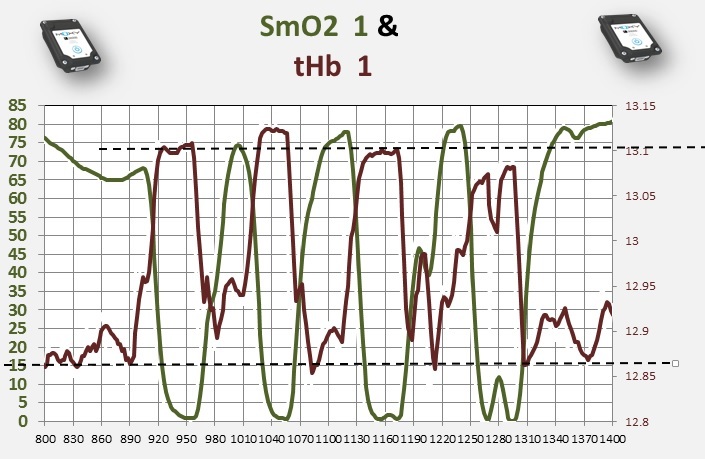 On the other side over time you can see O2Hb and HHb when looking at SmO2 and tHb as they all combine due to calculations. So try to look at this in your mind and you can see how tHb will be different in trend in this 3 cases , as well how SmO2 will be very different. The ability to deoxygenate under load can than give some information on the muscle fiber distribution and the ability to create performance O2 dependent or independent. For any new or already experiences MOXY coach and or TEAM. Collect MOXY information from your actual sport. We prefer if you can use 2 MOXY's one on the main muscle and one on a minimal or less involved muscle. Collect the data during a real game or real race and send the CSV file you download from MOXY to us. We than can give you feed backs and are able to think together using your experience and our feedback.